First thing I saw was these magnificent, frightening spiderwebs in the trees. They cover whole branches, sometimes even whole small trees. I tried to do a search on the internet for the type of spider, but couldn’t stand looking at all these spider photos coming up on my screen. So I still don’t know….they captivate me completely, scare me and fascinate me at the same time. There are many more of these enthrallments I find on my daily outings, but I’ll leave them for next time. Hi Ronell (and happy birthday! )I’m betting they are worms of some sort, not spiders–they turn into moths, but they do make these amazing webs, so not to worry–it’s not good for the tree, but nothing to be afraid of.Glad you’re back posting! You know – kudzu is the bane of the southeast, but I’ve always loved it anyway. 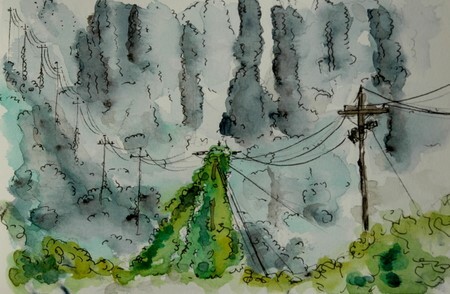 When I was a kid I would imagine kudzu shapes instead of cloud shapes – they make fantastic dinosaurs growing up telephone poles and lines…I love car lots, too…I think they are full of bluster and wind and untold treasures. :-DLet me know if you decide to head north, and we’ll arrange a meeting! I’m going to be on the Cherokee, NC side of the Smokies over Labor Day Weekend. 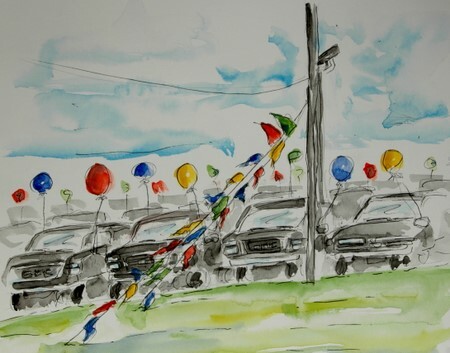 Terrific sketches – especially the car dealership! 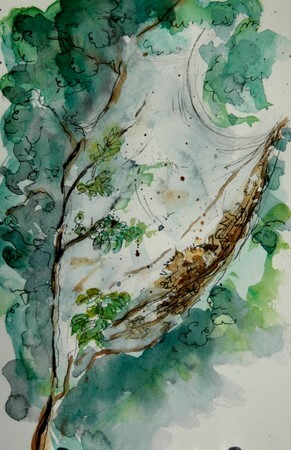 I think your big spiderwebs were made by what we called in Texas – TENT CATERPILLARS. They totally destroy trees unless kept under control. Thank you for telling me Cathy! I went to look it up and you’re right…it is the Eastern tent caterpillar…it is incredible! it’s nice to hear these kind of details about a place. looking forward to more. thank you. lions and tigers and bears…oh my! I’m thanking my lucky stars I’m a california girl! 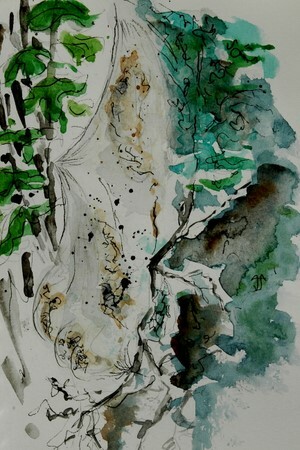 I had never heard of kudzu so did a google search…scarry! and those giant webs!!!!! yikes…your sketches both educational and beautiful!!! Come to California!!!!! no bugs or plants that will eat you up! hi ronell, I just read that you traded the Peugeout for a few months? Get a Mustang indeed, a convertible one! now seriously, hope your stay on this side of the ocean is great, can’t wait to read more of your impressions and see more of your beautiful sketches. I see that those caterpillars are a pest there too. We get them just outside of the city on all the trees. Gives me the willies. I did a google on the Kudzu, and am totally intrigued. what is truley amazing is the growth and it’s ability to create so many different shapes. As for the car dealerships, they are on almost every corner here in Canada also, all decked out as if there’s a grand gala going on inside. Great sketches of all three Ronell. So good to have you back posting again. Ronell: I find it fascinating to see SC thru your eyes — yes car dealers, churches, gas stations on every corner .. and that indominable kudzu .. and yes, it WILL cover you if you keep still … it’s redeeming qualities, though, the flour made from the rhizome is a staple in Asian countries, the flower makes an decent jelly … and there are so many kudzu festivals featuring baskets made from the vines, foods, etc…..Your sketches, as always are so painterly and beautiful!!!! Oh my goodness, I wouldn’t want to see those spiders!The perspective on your last painting (of the poles with stuff growing up them) is really well done. Using grey creates a sense of huge depth and distance.Love the other paintings too, and your descriptions. I’m enjoying your views of SC. Bugs are a BIG deal there-they’re everywhere… have you seen any of the beautiful moths flying around at night? I love watching your discoveries – seeing things that we all take for granted, fresh eyes reminding us of the beauty in the everyday around us. Thank you Ronell – your excitement is infectious. I think we have something similar here that attacks the umbrella pines. I could never paint a web like that at a distance and have it look like a web. Well done. Love the car yard too, very pretty composition with the bunting.